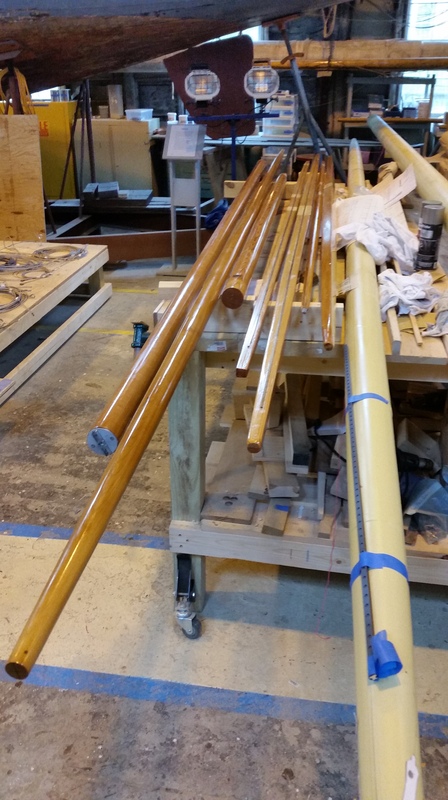 Joe helped Tim put a final sanding on wooden Spars so Tim could varnish them in final display coats. From left to right: topmast, spinnaker boom, bowsprit, #1 topsail club and yard, #2 topsail club and yard. The topmast is made of Sitka, but all the others are of Douglas fir; only the bowsprit is solid. The painted spars are the metal boom and mast. Meanwhile, Sandy has been filing, polishing, and buffing the dozen thumb cleats to be fixed on the yards, clubs, and spinnaker boom. 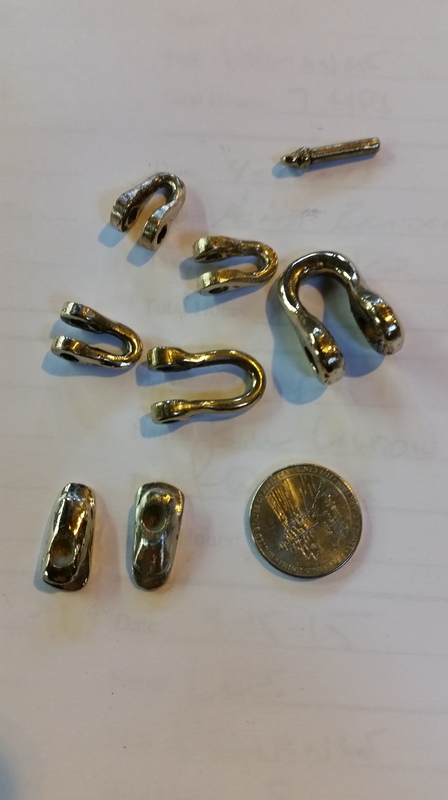 Also shown here are some steel shackles which are being polished before receiving nickel plating. Mike delivered the final batch of angle iron cheeks to our casting firm, but its small business owner is a brand new father and seems to have different priorities right now!! In the meantime, we’ll finish and fit the delivered cheeks. Metal work on the spreader continues, and Keith has been attaching lower shroud chainplates. He’ll then fit the spreader’s mast collar over this assembly so we can attach the spreader to the mast. 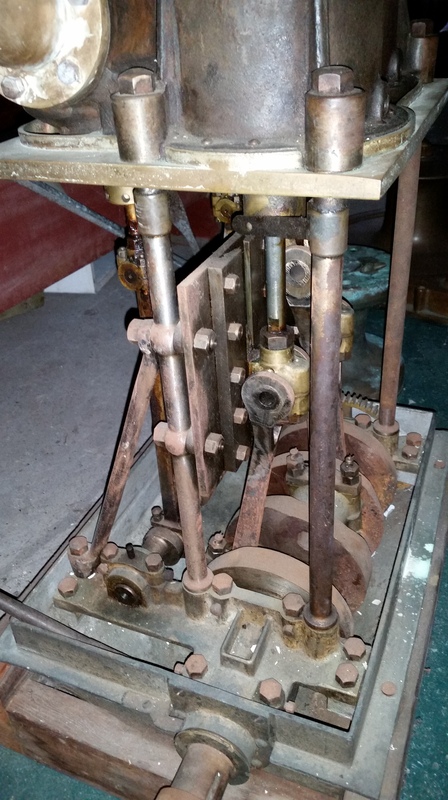 Lastly, Keith and Bill are also building a display stand for a small Herreshoff steam engine which will be part of a new museum display. We took a visit to the Museum archives to get its dimensions. This entry was posted in Project Manager's Welcome and tagged America's Cup, building 28, Herreshoff, Herreshoff Marine Museum, RELIANCE, Reliance Model, RELIANCE Project on April 23, 2015 by Herreshoff Marine Museum/America's Cup Hall of Fame. I met The RELIANCE Project site just by accident. But I found it extremaly interesting. RELIANCE and other AC boats interested me since I was a youngster and started my sailing. Now am 72 but still sailing with family and friends. For the first time I wound so many details about the boat which I admire through years. Would you let me know what is going on with the model now?